Danger by Elfo. Photo by Elfo. With much of Elfo‘s sculptural work, it’s unclear if he has just set up a scene on a street somewhere, photographed it, dismantled it and posted the photos online, or if indeed his work is more traditional street art in that he leaves it on the street to be enjoyed after he has left. Evening only really works from a specific angle and at a specific time in the same way that some op art has to be viewed from a particular angle, so he could have left the sign up, but most of the day it would just be confusing. Invisible Elfo would be great to stumble upon, but it probably couldn’t have lasted more than a day or two even if Elfo left it up after he took his photos, and I can’t imagine that he left a good hat, sunglasses, and pair of shoes on the street just in the off chance that the sculpture might surprise someone before completely falling apart. This piece certainly makes for a great photo and is a good use of that particular location, but again there’s no indication how long the intervention lasted. 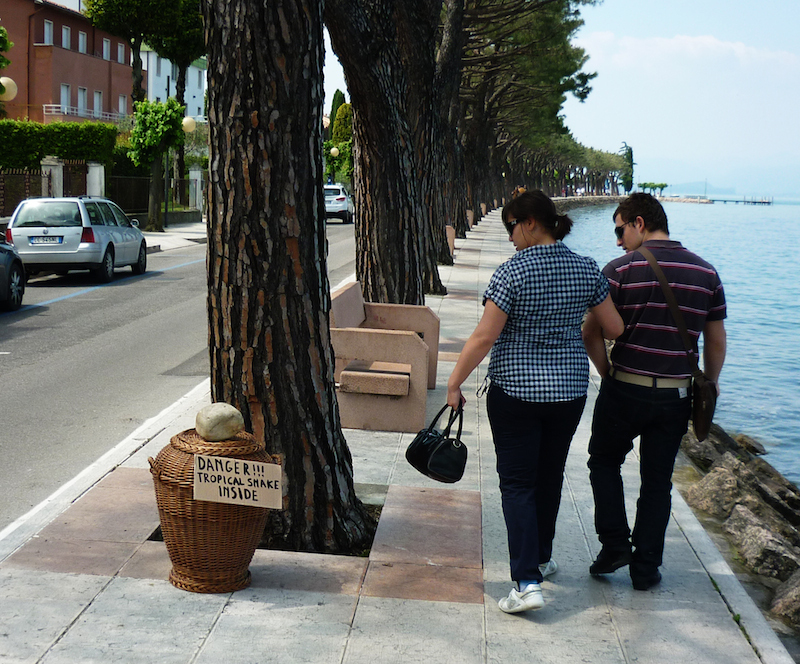 Finally, Danger is another sculpture that just wouldn’t make sense to leave lying around since the key component of the piece (a wicker basket) isn’t the sort of thing that you get for free and it’s actually useful. Will all of these pieces, Elfo could have left the work in place after he got his photos, but why would he, and how would we know either way? Credits by The Wa. Photo by Coopervane and courtesy of The Wa. The Wa is probably best-known for a piece called Credits, made in the summer of 2012 at the Dockville festival in Hamburg, Germany. 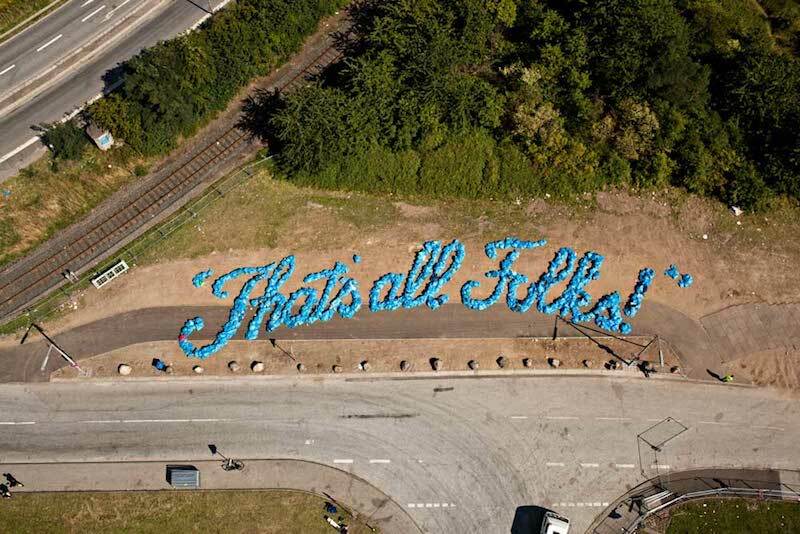 Credits is made out of trash bags full of trash from the festival, which were spread out across a field of dirt to spell out the phrase “That’s all Folks!” in the same font as the old Loony Tunes closing bit. It’s an interesting project, but it surprised me a bit that so many people readily accepted it as street art and spread it around the web so quickly. After all, it took a drone with a camera attached to get a photo of the piece. I’m not sure how long Credits remained in place for, but a responsible festival would never let trash bags stay out in a field like that for very long. Atlas by The Wa. Photo by Davide Marconcini and courtesy of The Wa. While not as well-known of an artwork, The Wa’s Atlas is perhaps the most super ephemeral / do it for the photo / install, document and dismantle piece of street art I’ve come across. I can just about guarantee that a lot of people who read this will contest that Atlas is even street art, and maybe they’re right, but it was done in public by a street artist, so that alone means something. Basically, what The Wa got a plastic globe that blew up like a beach ball and tossed in in the air at the site of Maurizio Cattelan’s L.O.V.E. sculpture in Milan (yes, that’s the name of the giant middle finger in a public square in Milan). 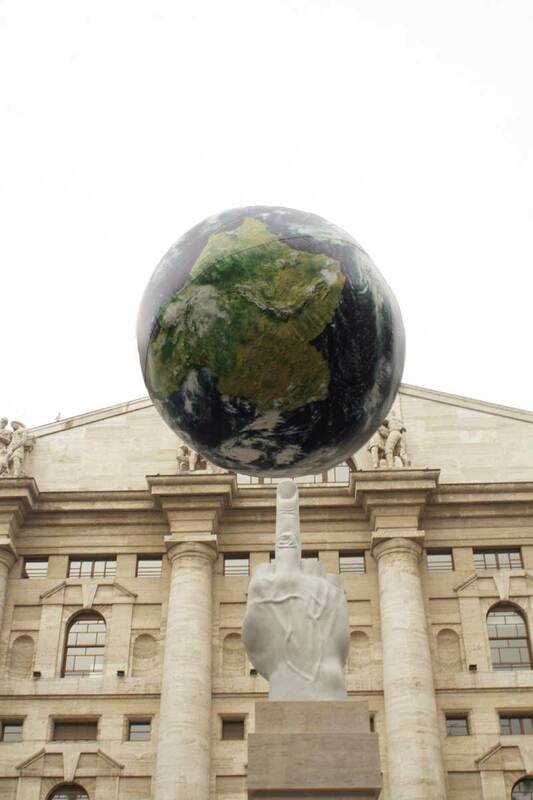 He took photos of this and one of the photos, the one he posted online, makes it look like the globe is balancing on the middle finger of Cattelan’s sculpture. Did people see this piece being made? Sure, and they probably thought The Wa was a bit strange. But it’s really only those who saw the documentation of the work who have seen what The Wa was really going for with Atlas. Yes, it’s a piece that was made in public without permission much like street art and The Wa is a street artist, but Atlas is really all about the photo capturing a split second perfect moment, which was then shared online. With a split-second look at the photo on a blog, it’s funny and most people probably wouldn’t question it. Most viewers would probably think “The Wa guy found a giant globe, tossed it in the air a few times, and took this perfect photo.” But what if The Wa didn’t use a giant globe, but just played a trick of perspective with a beach-ball sized globe close to the camera and the statue far away? From the photograph alone, there’s no way to tell. Atlas is an extreme example, but it’s not all that different from any other piece of install, document and dismantle street art. Is this kind of work street art? In a physical space, maybe not. But once Atlas and Credits were online, the works appeared on street art blogs and were shared just the same as any of The Wa’s work that clearly qualifies as street art. Sometimes we know for sure, but often it’s quite unclear how long a piece of street art lasts these days. Particularly with sculptural work, there’s at least a suspicion with a lot of it that the artist installed the work, took a photo, and immediately removed the work, and often it’s impossible to prove either way, so instead we just have to love the work for whatever it appears to be. The install, document and dismantle artists use the street like a set and build a scene to photograph, with the intent of distributing the photograph online. That’s definitely not the same as going out and putting up hundreds or thousands of wheatpastes, but it’s a valid way to make art and reach people today.